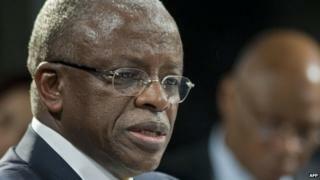 Uganda's president has sacked his prime minister, a former close ally now seen as a potential rival in 2016 elections. Amama Mbabazi has been a government minister for more than 20 years. In 2012, millions of dollars of public money went missing from the prime minister's office but Mr Mbabazi denied any involvement. MPs from the governing National Resistance Movement earlier this year decided that President Yoweri Museveni would be their presidential candidate. BBC Focus on Africa editor Rachael Akidi says the sacking does not come as a surprise, as some party members have accused Mr Mbabazi of privately using the position to mobilise support for his own presidential ambitions. Mr Mbabazi himself publicly maintained his support for the president - saying he would not challenge President Museveni as long as he was party leader. However, his wife publicly criticised the decision to name Mr Museveni as the presidential candidate. Mr Museveni has been in power since 1986. The 2012 scandal led several donor countries to cut aid to Uganda. The presidential statement announcing his sacking did not mention the missing money and instead thanked Mr Mbabazi for his contribution to the country. He has been prime minister since 2011 - and before that had held the portfolios of security and defence. Health Minister Ruhakana Rugunda has been named as the new prime minister. Can Uganda cope with three times as many people?